Rainerhaertl.de — Christian Kaula. I make stuff simple. 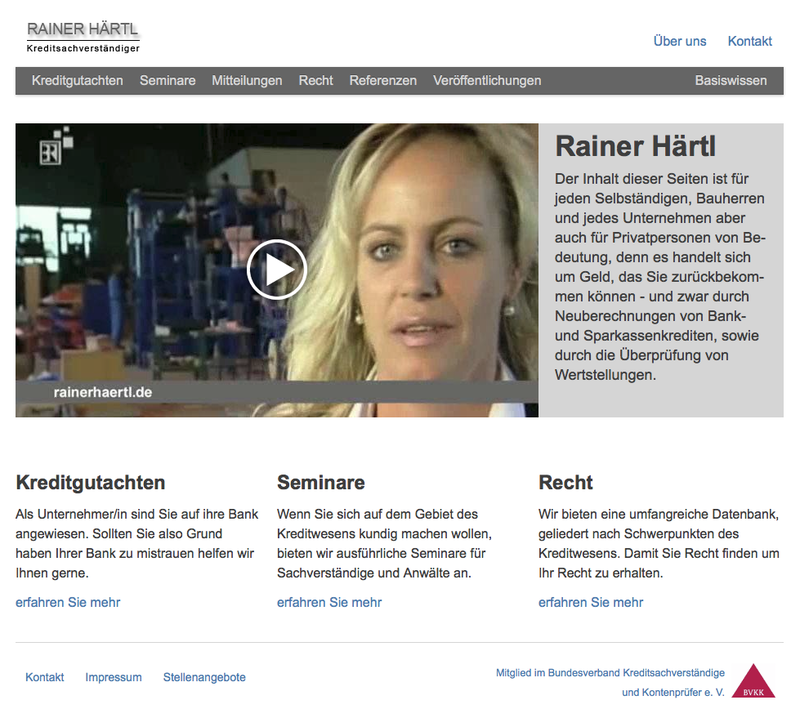 One of these days Rainer Härtl — a respected credit expert — asked me why his website could hardly be found on Google and if I could have a look at it. Seeing that most of the data on the site was in PDF format (scanned images) it was not hard to find a reason. As the old site was not exactly state-of-the-art and far from optimal usability wise we agreed on a complete redo. First point on the agenda was to find out what the actual goal of the website is. As it turns out Rainer really believes in helping the people that get screwed by banks. If he is unable to help directly he tries to give people (and lawyers) information that enables them to get their money back. Most of the information offered on the site needs little to no updating and since Rainer has better things to do than keeping a CMS up to date we agreed on a static site solution. The whole site is generated by Middleman because I think it’s the near-perfect combination of simplicity and extensibility. Two other reasons for why I really enjoy working with Middleman are its template helpers that allow for Django-like template inheritance and their data management system. Yep, it has a data management system that is based on YAML files (okay no bonus points to give here…) and as simple as can be. On the front end I opted for a customized copy of Bootstrap for Sass a Sass version of Bootstrap on top of hand crafted HTML5 with a few hints from HTML5 Boilerplate. Especially when it came to writing a bullet proof .htaccess it came in really handy. And to make Internet Explorer tag along I threw in html5shim. There are self-hosted videos on the site so Video.js and a combination of WebM and H.264 videos was used for maximum HTML5-ness while losing only a minimum of cross browser compatibility. It was a fun project that involved not only coding but also a lot of content structuring. I enjoyed that quite a lot. What I also really like about the website is that it really is state-of-the-art. I would be hard pressed to make it faster or point out something that I wish would have been solved in a more modern way.